Tim has been a licensed Realtor® since 1999 and a licensed Broker Associate since 2009. His level of experience comes from all facets of real estate, making him one of the most diverse and experienced Realtors®/Brokers in Meridian and in the surrounding area. He has an extensive construction background with more than 28 years of combined experience and is currently the owner of Heritage Building Corporation. 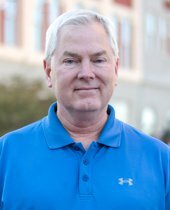 Along with construction, Tim also is part owner of Allred Investments, LLC, which is one of the largest property management firms in Meridian. Allred Investments has serviced the area in Residential and Commercial Leasing for over 15 years. Tim is married to Linda McRae Allred, and they have two daughters, Karen and Anna and son, Cliff. Tim enjoys jogging, snow skiing, gardening, and swimming and is an avid painter and photographer.